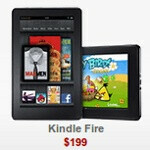 10.1-inch Kindle Fire coming instead of an 8.9-inch model? The Amazon Kindle Fire is one of the best selling Android tablets first and foremost because of its price, and now it’s said to get an upgrade in the form of an additional, larger model. The new Kindle Fire will feature a 10.1-inch display instead of the previously rumored 8.9-inch display, according to Taiwan’s rumor fountain DigiTimes. Both the 8.9” and 10.1” Kindle Fires, of course, only exist in rumorland, so we’d take this with a shade of doubt. Currently, Amazon is selling its 7-inch Kindle Fire for $199, and if it releases larger tablets at a similarly low price point, it might hit the right spot for first-time tablet buyers and gift givers. If the rumor proves true, then Amazon would have both an upgraded 7-inch Kindle Fire and a 10.1” Fire in its lineup, allegedly ready for launch in the second half of 2012. Additionally, DigiTimes is reporting that Amazon has downsized its order of E-Ink displays - the easy on the eye screens for e-readers. Last month, sales of e-ink screens have dropped by 62% on the year. they had no competition on the 7" side thats why the success but coming to the big side.. will be their failure.. I think Kindle Fire has its own market and they'll continue to make profits in 10 inch tablet segment as well. Sure the kindle hasn't had much competition in the 7 inch size but that's mostly because the price point is so low in comparison to the level of hardware that is offered in the device. Sure it is a little more limited than a standard tablet, but most of that can be overcome with a few software patches. If you are on the fence about the device you can learn a little more about it here tablets dot herobo dot com I thought it was refreshingly unbiased.